Time sure seems to be flying past...it's June, which means it's time for another fun and delicious Secret Recipe Club reveal! My assigned blog this month is Kitchen Trial and Error. Kate lives in upstate New York with her husband and two young sons. Like me, her blog started at the urging of her husband...and it's blossomed into more than a hobby for her too! I poked around her blog and found some really great recipes that caught my eye...but I opted to make her easy and decadent Peanut Butter Granola Crispy Bars. I literally had all of the ingredients necessary to make them on hand in my kitchen, so I took that as a sign and whipped up a batach last week. Peanut butter and chocolate...what's not to like?!?!? These addictive granola bars have a great texture thanks to the addition of crispy rice cereal...but the addition of oatmeal makes them a bit hearty as well. I added 1 tbs. of cinnamon to the mix, but otherwise followed her recipe pretty closely. I used crunchy peanut butter instead of smooth, because that's what was in my cupboard...and I doubled the amount of vanilla she called for. We enjoyed having these crispy granola bars for breakfast with a piece of fruit or yogurt, and they also make a great after-work snack to tide you over until dinner. If you love chocolate and peanut butter paired up, you're going to go nuts for these easy-to-make granola bars. Step 1: Line an 8x8 pan with parchment paper; set aside. Add the butter, honey, peanut butter, and brown sugar to a small saucepan. Heat over low heat until the butter melts, then use a spoon to stir until combined and smooth. Add the vanilla extract. Step2: Add the crispy rice cereal, oats, and cinnamon to a large mixing bowl. Add the reserved peanut butter mixture and stir until the mixture is evenly combined. Press the mixture into the prepared 8x8 pan with a spatula or pristinely clean hands. Sprinkle the mini chocolate chips on top of the warm mixture, pressing in slightly with your hands. Step 3: Refrigerate the pan until the granola mixture is set. This took about 30 minutes in my fridge. Remove the parchment from the pan and use a serrated knife to cut the mixture into 9 bars. I found the mixture to be a bit crumbly, so don't panic if you end up with a few broken bars...they still taste amazing! Store the bars in an airtight plastic container in the fridge. 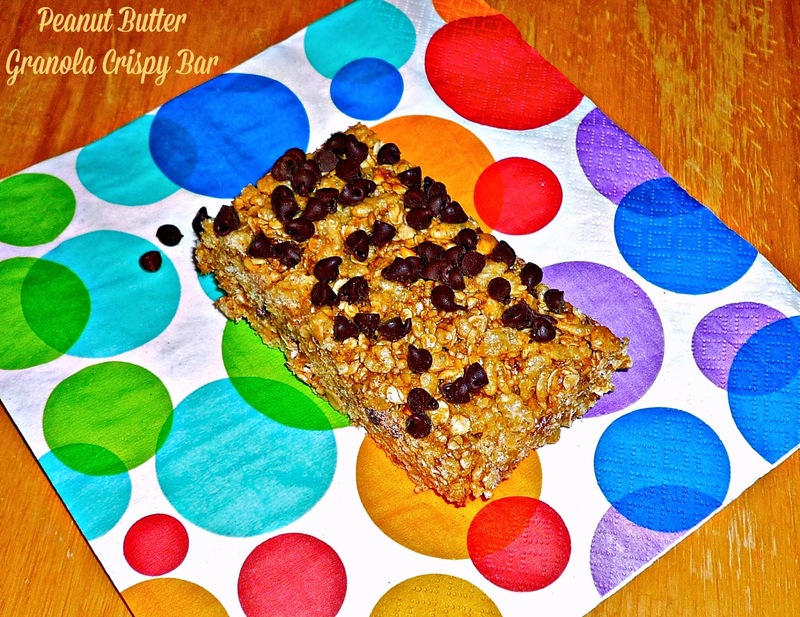 These granola bars are a snap to make...and they're full of the peanut butter-chocolate taste I love! The texture is light and crispy, and I love that I controlled exactly what went into them. Because of the fiber-rich oatmeal and protein packed peanut butter, these granola bars kept me full all morning long. I paired them with a banana or a small container of Greek yogurt for a perfect at-my-desk breakfast. I hope you'll give these amazing granola bars a try very soon...and I hope you'll check out the rest of the amazing recipes that my fellow Secret Recipe Club participants are sharing today.